Competition is tight in the corporate world. Companies are forced to strive to become better than their competitors in order for them to attract a larger audience. However, this is not an easy process. A company has to focus on the internal and external aspects that may affect their performance. For any business, a market analysis will allow them to further understand both their customers and competitors. With this, they are able to innovate and improve their business operations. The first thing that a business can do is gather demographic data. With this simple analysis, they may conduct their market research in the simplest way possible. The company may also administer a thorough research by gathering data through customer feedback. Next, a business should see things from their customer’s perspective. This would include how such product or service may be beneficial to them and what issues need to be addressed immediately. Finally, providing visuals of the market’s behaviour will give the team a clearer understanding of the data gathered. This would include supporting documents, charts, and graphs. A company would not exist without the presence of its market. Because of this, a business analysis must carefully understand the market’s behaviour in order for them to identify various factors that may potentially affect the company’s operations. The analysis may not tell you how you should run your business but it will provide insight on what may be done to improve performance. Additionally, market analysis will also allow a company to look towards its internal aspects. This would allow them to understand their customer’s views and feelings towards the products and services offered. Industry analysis and market analysis are often used interchangeably. However, the two are different in such a way that they actually serve one another. For example, most popular clothing lines carry apparel inspired by the music industry. 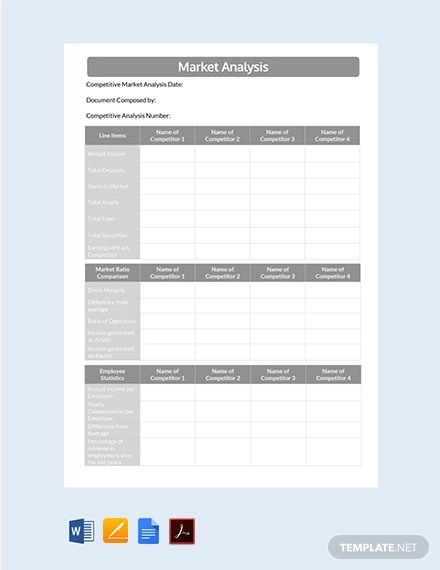 Market analysis studies the market demands in terms of product prices and offerings. Industry analysis, on the other hand, interprets the relevance of a given industry to the demands of its market. It is used to examine the internal forces of an industry to supply to the demands of market distribution. Overall, industry analysis and market analysis are used by companies to specify financial report performance. Conduct a thorough research. For a business, understanding the market’s behavior based on customer consumption is essential. This can be done through various surveys. Be aware of market trends. It’s important to focus on the demands in the market to know what should be produced or developed. Understand internal strengths and weaknesses. This could be anything from employee performance, market sales, as well as competitive advantage. With this, the company may identify elements that need to be resolved or improved. Study the competition. In order for the business to stand out among competitors, it must first understand the competition’s operations. This would involve the financial, marketing, and production aspects of the competitor.